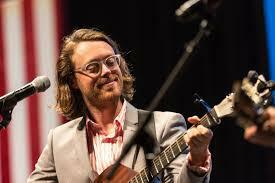 He may not have intended to start a trend, but I hope Jeremy Messersmith's micro-tour of Minnesota becomes one. Messersmith's pop-up shows last about 15 minutes, the length of his new album, 11 Obscenely Optimistic Songs for Ukulele, and are situated in front of Minnesota's iconic landmarks--the Kensington Runestone in Alexandria, Otto the Big Otter in Fergus Falls, and Paul and Babe in Bemidji. I recently interview Jeremy about this tour and more on Centerstage Minnesota. You can hear it by clicking below. Jeremy will be at Paul and Babe tonight/Wednesday, May 31, at 5:30 for a free pop-up concert, and at the Headwaters School of Music and the Arts at 7:00 for a full concert.